The most interesting of spiders to live in Australian backyards. Question: Do you like spiders? The mere thought of a spider is enough to elicit feelings of discomfort for some. The sight of one will induce many into a state of panic. 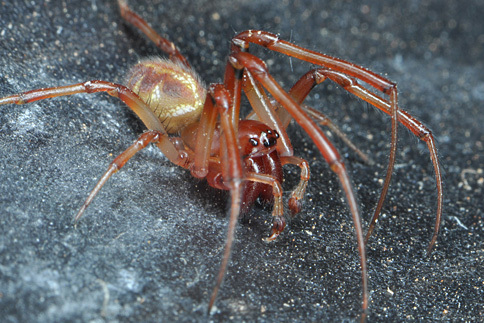 Personally, I am not too concerned by the presence of spiders, except perhaps for the huntsman (Delena spp.) owing to it’s size and the white tail (Lampona cylindrata) for its potential to cause severe injury. That is the sort of response most people would say was ‘normal’. What might seem a little more unusual would be to admit that actually like a particular type of spider. Ever since I have been a child, I have had a mild fascination with Leaf-Curling spiders (Phonognatha graeffei). A native of the eastern states of Australia, these were always a common sight in the garden every summer. 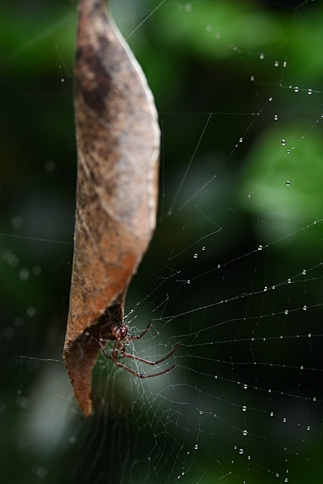 Leaf-Curling spiders are easily identifiable because they build a shelter from a rolled-up leaf, which they place in the centre of their web. (No other spider does this). Because of this, they’re easy to spot and therefore pose no real danger to anyone. (In any case, they’re non-venomous). Should a person disturb their web, their instinct is to withdraw into their leaf rather than confront. However, if an insect lands in the web, they’ll waste no time in rushing out to grab themselves a snack! The Leaf-Curler is actually quite attractive for a spider, being brightly coloured with yellow and black markings across their over-sized abdomens. Leaf-Curling spiders belong to the Araneidae order of orb-weavers. Their web is constructed as three-quarters of a circle, with the leaf suspended in the missing section at the top. Oddly for spiders, the male co-habits with the female, even sharing the same leaf. 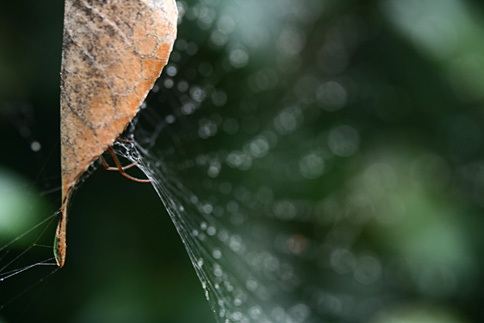 However eggs are laid in a separate curled leaf away from the web. Leaf-curlers are an annual species, and die at the end of summer. Because of this species’ distinctive shelter, harmless nature, beautiful colours and peculiar life cycle, I welcome the arrival of Leaf-Curlers into the garden each summer. It is always interesting to see where they’ve built their webs or what they’ve decided to use for a shelter. 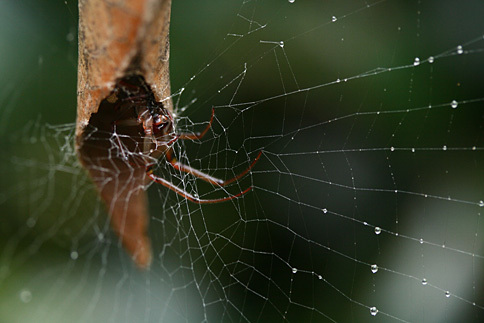 Have a close look for Leaf-Curling spiders next time you’re in the garden. All images © Adam Dimech, except the last image by Darcy Moore (used under a Creative-C0mmons Licence). Beautiful photos! And nice juxtaposition of this entry after your previous post about a “fly”. Like you I am not too fussed by most spiders, but I am particularly wary of huntsman after getting bitten by one (I inadvertently disturbed it by lifting the front door mat) – it was very painful for several days. Thanks Adam. I have a number of leaf curlers in my front yard now. But my favourite visitor is my beautiful & very large Garden Orb Weaver. She has taken over my driveway forcing me to park in the street. It’s that or destroy her web, which I will not do. I am no fan of spiders, but I have so much respect for the stunning, hard working Orbs. Now I think I know whats in my backyard. Thanks Adam now i think i know whats in my backyard.